The AFOQT Block Counting subest consists of 20 questions and must be completed quickly in 4.5 minutes. You will be tested on your ability to read and see into a 3 dimensional setup of blocks. This part of the test measures your ability to “see into” a 3-dimensional pile of blocks. Given a certain numbered block, your task is to determine how many other blocks the numbered block touches. Blocks are considered touching only if all or part of their faces touch. Blocks that only touch corners do not count. All of the blocks in each pile are the same size and shape. Every question is worded exactly the same. 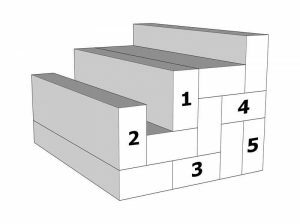 The question reads, “In the following block-set, how many other blocks are touching block number X?” where “X” is a number one through five. Find the correctly numbered block and answer with the number of block faces that touch it. Look at the sample block-set below. When you are ready to begin, click the “Start Quiz” button below.